The good thing about eclipses is that there are so many enthusiasts preparing well. I just found these visibility maps of the eclipse, which are very useful since the only landfalls of this eclipse are places with quite a bit of mountains. I'm semi-organising a trip with 7 over people for this eclipse. I'm beginning to look forward to it now. I'm excited to hear how this event goes for you! If it helps, another great resource for climatology maps, data and discussion along eclipse tracks is here through Jay Anderson's Eclipser webpage. Was checking the weather forecasts for the Arctic. An impressive ~950mb low affecting Svalbard right now. I guess it doesn't matter much for your planning purposes given there's not really much room for mobility up there, but if you're interested, the long range GFS model runs are starting to get some good synoptic scale consistency. A series of low pressure systems will churn up the east coast of Greenland throughout this week, then high pressure is expected to build over Scandinavia. Predicting exact conditions on the 20th is extremely sketchy this far out, but as of now it's looking like Svalbard might end up right in the middle of a short lived ridge in the high pressure between systems. Atmosphere up to 500mb within this ridge is fairly unsaturated, which is a good indication for little cloud cover. All in all the eclipse period is looking favorable at the moment, compared to average conditions this time of year. The Faeroese island have a lot of clouds and it's only a small chance that the eclipse will be visible there, probably <25%. 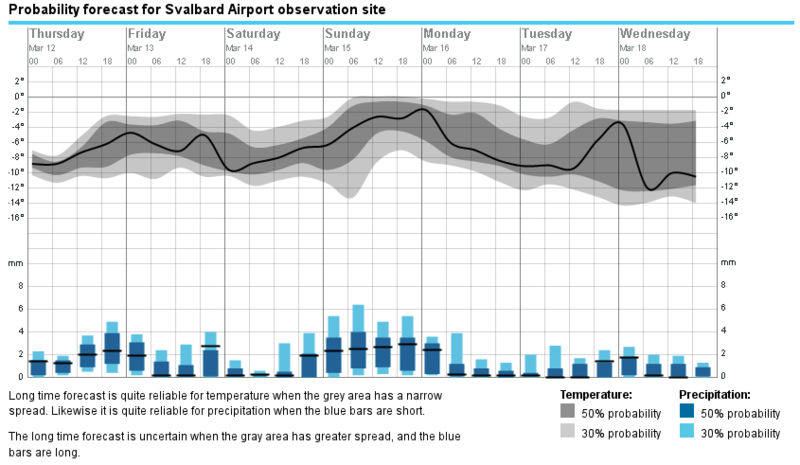 Longyearbyen in Svalbard is a semi-desert (the precipitation is about 200 mm/year) and has a 50% chance of sunny conditions in March, and is the best location for this eclipse. What we need is stable winds from the E or NE. 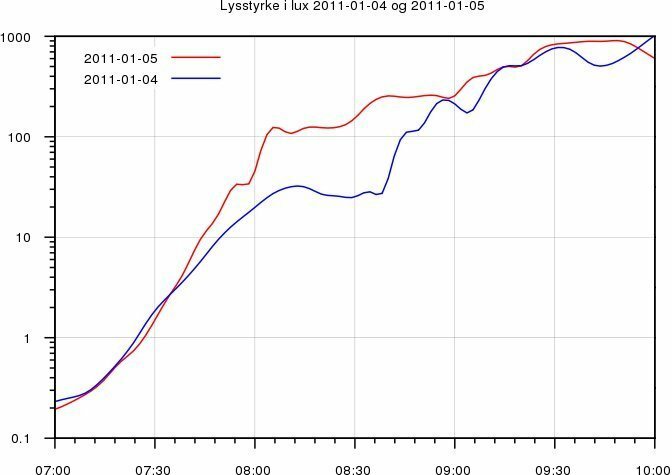 The large Isfjorden was frozen over earlier this winter, the first time in several years, which improves the weather in Longyearbyen slightly, but a storm emptied the fjord a few weeks ago and I doubt it will refreeze. As for mobility, with a snowmobile you can be pretty mobile. However, due to the huge influx of visitors, one has to rely on locals to get snowmobile access (and a blooming private eclipse market has emerged, since all hotels were booked by operators like Travel Quest many years ago). I've rented a car though, just for the sake of some mobility. There's a road stretching 25 km or so east/west which will offer some mobility. But I don't believe in chasing blue sky. I think we'll decide on a location a couple of hours before the eclipse and stick to that choice. It's also been speculated that aurora could become visible during totality. Even if there is high activity, I remain sceptical. But it's worth checking the activity during the eclipse. If there is a powerful outbreak, it's a result nevertheless if it turns out that nothing can be seen. The nights are beginning to disappear now and the nights enter nautical twilight around the date of the eclipse. Still dark enough to see any aurora well, but I'll only be there for one night. That likely means that the Russians haven't yet established the base, otherwise it would likely drift too far off the pole by mid April. 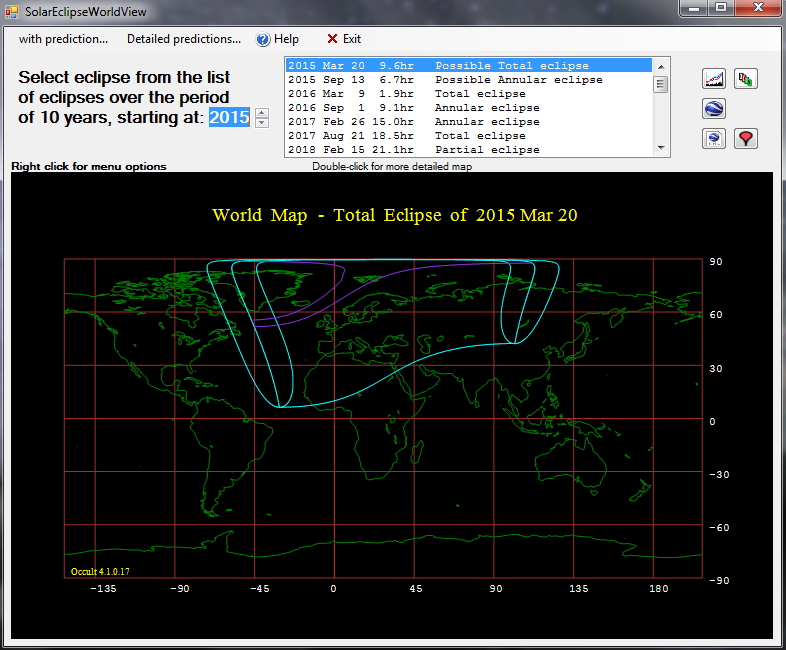 Also, there is no mention of the eclipse on the Russian web page. Last update was on 18 February just saying that they've begun transporting gear to Longyearbyen. But if anyone will be watching the eclipse near the pole, it could be these Russians beginning preparations for the base. 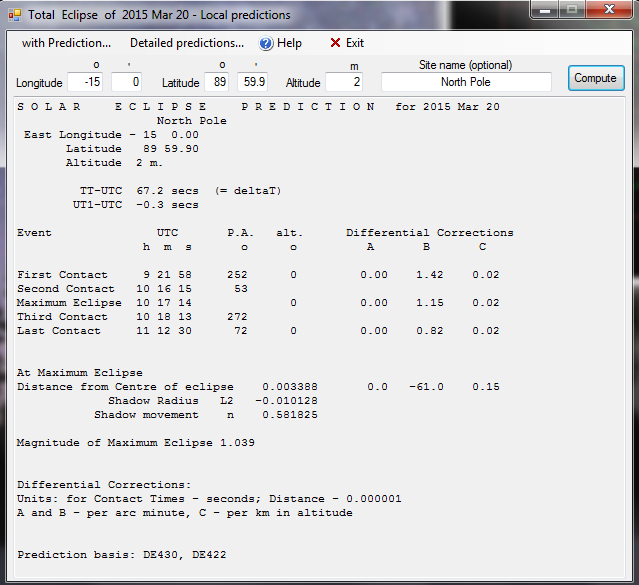 If the Faroese Islands get good weather, around 60.000 people could be around to witness this eclipse. If not, only a few thousand will see it. 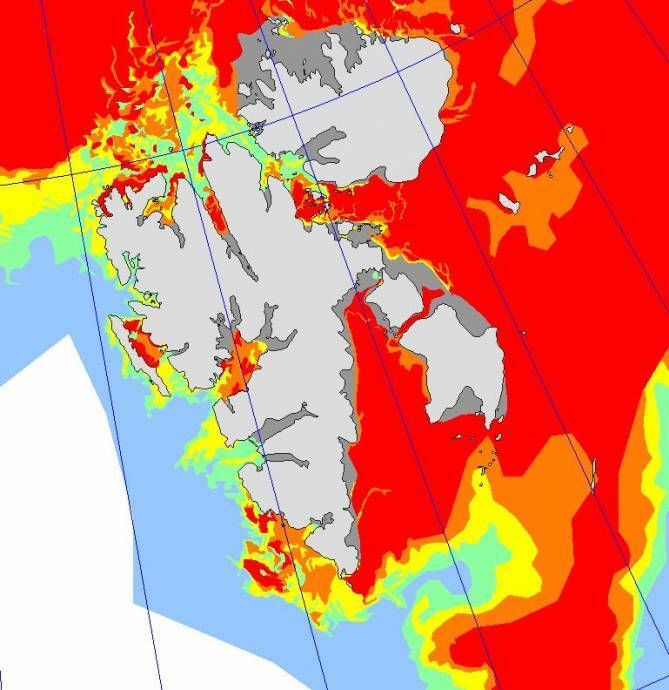 I suspect around 3000 will be present in Longyearbyen, fewer than a thousand elsewhere on Svalbard and probably fewer than 100 elsewhere in the path at sea or on the ice. 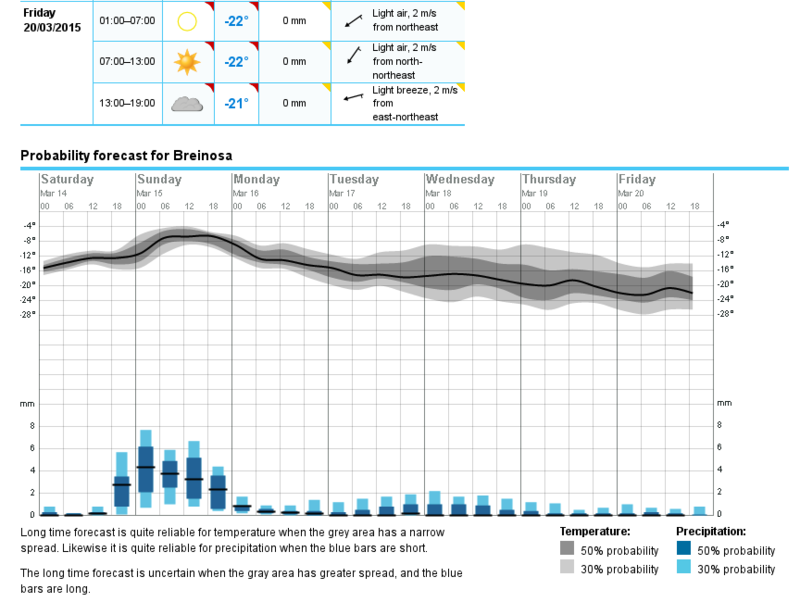 The latest forecast is promising (at end of the road outside Longyearbyen furthest away from the ocean). The Sun will be covered to about 80% from my location, will the sky be noticeably darker? At 80%, if it's totally overcast, you'll likely be able to measure a drop in light, but you'll hardly notice it with your own eyes. Ordinary changes in cloud thickness can give similar variation. If you can see the sun, you should be able to feel that the light gets slightly more pale, and the shadows will become sharper. The sky will look normal. The appearance of the sky in relation to how much of the sun is covered is highly nonlinear. At 50% obscuration you don't notice much of anything. By 80% the sky is a deeper darker hue than normal, and you see differences in the quality of light, color, and shadows. By 90% you can tell that the sky is darker in the direction of the approaching shadow, and in the last few minutes before totality the rapidity of changes in the environment are overwhelming. And of course totality itself is a different experience entirely. Or so I hear from people who've experienced it, anyway. The most I've seen is 80%. Yes, partial and total eclipses are very different experiences. A quote that I've heard a few times, supposedly from a French solar physicist, is that a partial eclipse is like a kiss on the cheek, but a total eclipse is like a night of hot love in Paris. I did some googling to judge the possibilities of seeing aurora during totality. One paper puts the limiting magnitude during totality at +3.5, and this YouTube video suggests that the limiting magnitude near zenith is +3.5 when the sun is 7 - 8 degrees below the horizon. So, the question becomes, can you see aurora near zenith when the sun is just 7 - 8 degrees below the horizon? It doesn't sound impossible, certainly not with a camera. So lets hope for aurora and that someone succeeds. The the daytime aurora is redder than the nighttime aurora, but the red light is more blurry and requires darker skies, so if anything is seen, I think it will only be green aurora. midtskogen, does a total eclipse roughly equal the sun being 7-8 degrees below the horizon? Because as far as I can tell that's a pretty dark sky, meaning you'll need a flashlight or another light source in order to see properly. It's a number coming from quick googling, so a grain of salt etc... It's a bit difficult to compare, since in twilight you have one bright side of the sky and one darker, whilst during totality the sky is brighter in all directions near the horizon. That means that the entire sky will be much brighter during an eclipse, only zenith will be roughly the same (if these numbers are correct). 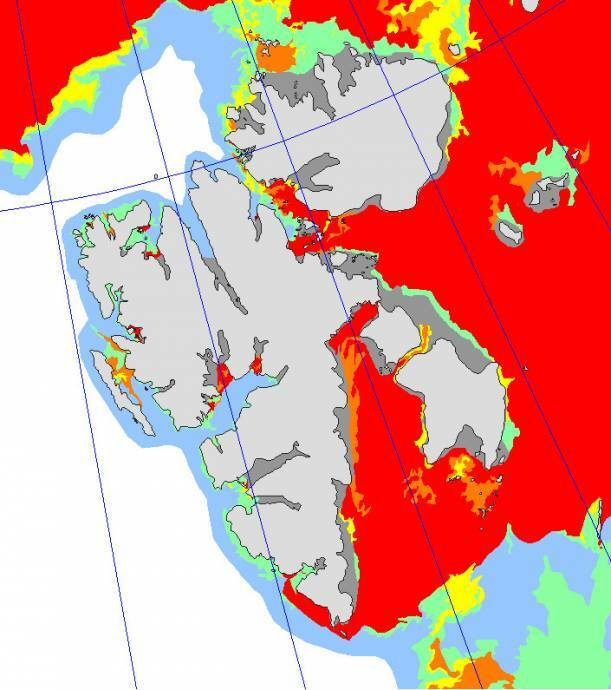 But zenith also happens to be roughly where to expect daytime aurora in Longyearbyen (nighttime aurora is on the other hand more frequently seen to the south). A live stream from the eclipse will appear here. At least we have the internet and streaming for these things. Seems like there will never be one in an area I will be. One week to go. GFS narrowing down nicely on an upper atmosphere solution for the 20th, and inter-model differences generally looking good. Local weather forecasts should start becoming more reliable over the next couple of days. That's kind of the general and unfortunate thing about solar eclipses. They're relatively rare and cover such a small area that any given place on Earth is unlikely to receive one in a 100-year span. Unless you're very lucky, you pretty much have to travel to see it in person. The August 2017 eclipse comes fairly close to you though, doesn't it?